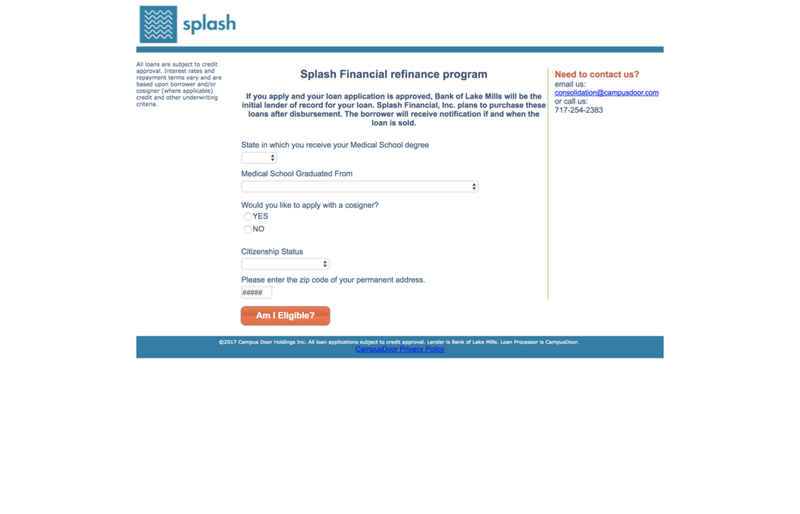 Splash Financial - Making a Splash in Medical School Debt — Future Proof M.D. Originally conceived as a college savings platform named "LendULink", the Cleveland based startup struggled to gain traction. 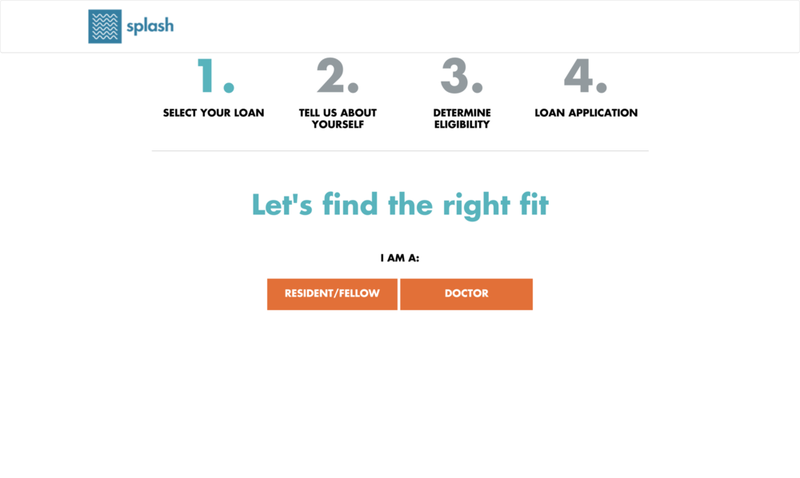 in 2015 the company pivoted to focus on medical student debt refinancing and Splash Financial was born. 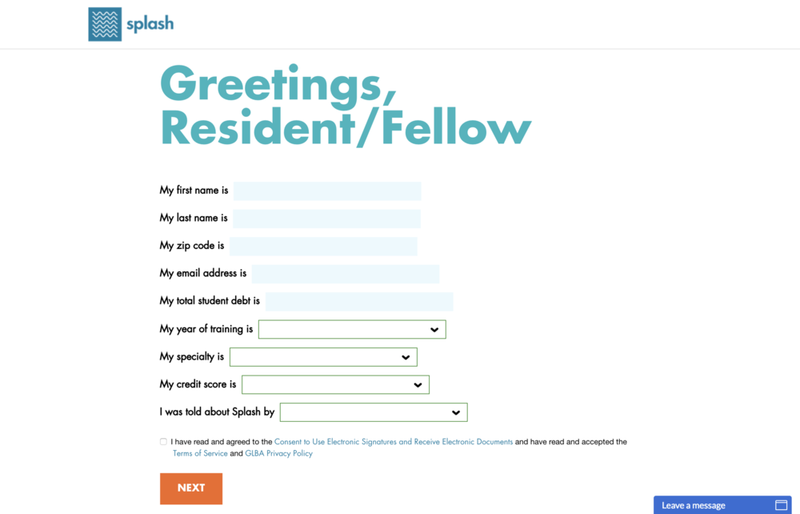 Splash Financial officially launched to the public in April of 2017 and is, to my knowledge, the newest player in the student loan refi space. Pay $1/month during residency and fellowship (Up to 7 years). Your repayment period starts following your residency & fellowship training. If you choose to pay $1/month, your loans will continue to accrue interest and that interest will be capitalized (added to your principal) at the end of each month. The maximum amount of time you can pay $1/month is 84 months (7 years). To qualify, you must be currently in or have completed a medical residency and/or fellowship. The maximum loan amount is $346,000 and the minimum loan amount is $25,001. Refinancing your federal student loans through any third party lender will lead to the loss of certain benefits such as income driven repayment and PSLF. Splash is no different here. Reasonable interest rates - for example, Laurel Road's current 10 year fixed rates range 5.05-6.75%. Simple product offering - single refinance option takes away the complexity of analyzing and comparing different repayment terms. $1/month payment - the biggest attraction of Splash Financial over other student loan refinancers. This dramatically increases your cash-on-hand during the "lean years" of residency and fellowship. No origination fees or prepayment penalty. 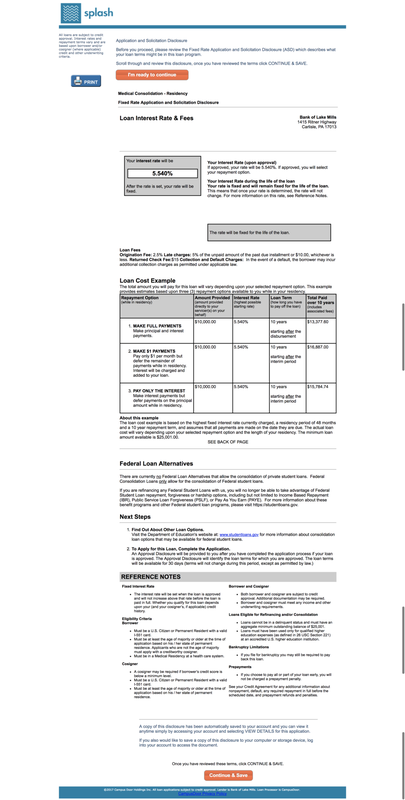 While Splash may be a fintech startup, your refinance loans are originated and funded by Bank of Lake Mills - a Wisconsin based community bank who is a member of FDIC. Click on "GET MY RATE"
Splash Financial may be the newest kid on the block, but they are ready to make a splash (see what I did there?) in the medical education debt ReFi space. While all student loan refinancers should pay attention, Laurel Road in particular should be on notice. Splash's $1/month offer represents an attraction alternative to their $100/month resident & fellow student debt refinancing option. As usual, before you decide to refinance your student debt, I encourage you to read my previous post - To Be, or Not to Be...Consolidated/Refinanced...On Your Student Loans... If you decide that refinancing is the way to go, I encourage you to visit the Future Proof ReFi Central to compare the best offers among FPMD partner lenders. FPMD Readers - apply for your Splash Financial ReFi loan thru this link and receive a $300 bonus upon loan closing. Full Disclosure: Future Proof, MD is an affiliate of Splash Financial which means if you apply through the link provided above, FPMD may receive a referral fee payment. For details on FPMD's advertising policy see Advertising Disclosures.